Match workloads to global GCP sites and instance types quickly—or apply your own exact workload size to a custom instance type. Map your entire VMware infrastructure against current pricing and configuration options from Google Compute Platform (GCP). Choosing a public cloud, and then configuring that your choice cost-effectively can be a complex process. CloudPhysics instantly shows you the right path through this complexity. Now you can make the smartest selection among the many Google instance types and classes. You can be assured of receiving the most recent, highest-fidelity insights, since CloudPhysics collects performance data at 20-second intervals. You can lower your costs even further by automatically matching lower-cost geographic regions to reduce migration outlay. 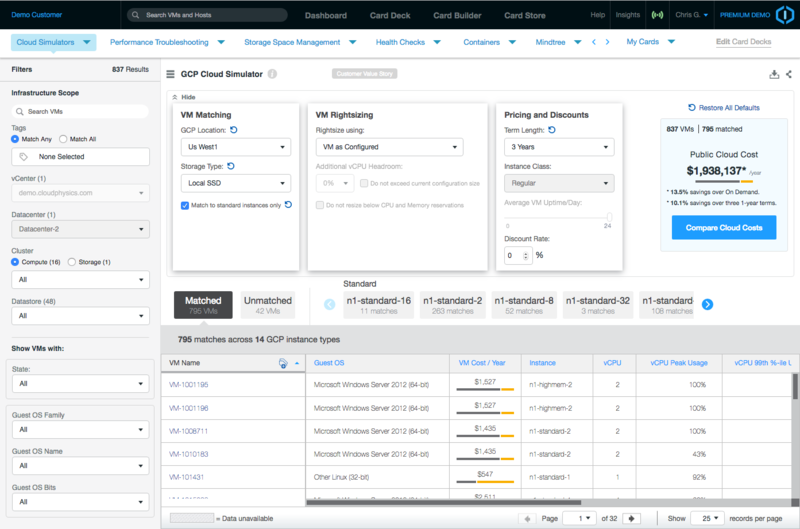 With the GCP Cloud Simulator, you’ll see at a glance which choices make the most financial sense because results are presented in easy-to-understand dashboards and analytics. How Does the GCP Cloud Simulator Work? Once activated, the CloudPhysics virtual appliance collects and analyzes performance and configuration metadata on your virtual infrastructure. You see results in clear, intuitive, and easily understandable dashboards and analytics. Now you and your team can access the same verified information when planning the GCP migration strategy. You can also benchmark key parameters against the vast CloudPhysics data lake, VMware best practices, and the CloudPhysics community.